Bathroom remodels are the most popular remodeling jobs. If your client wants their bathroom remodeled, they will need to view all of the materials available to them. At ProSource®, we have a showroom that has a collection of all the bathroom materials you will need. Better still, our showrooms displays dozens of different remodeling ideas to help inspire both you and your client. Bathroom sinks vary greatly. 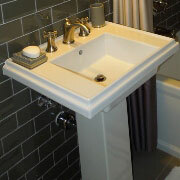 Because of this, it is nice to know that ProSource showrooms a great array of bathroom sinks to choose from. Bring your client along with your when you come to ProSource. That way, you both can browse your options and agree on a choice. Sink faucets vary almost as much as bathroom sink basins. 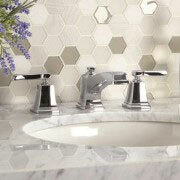 Ultimately, the only way to choose a faucet is by determining what style you want and in what metal you want. Showers are an important feature in a bathroom, as they are one of the best ways to improve the overall aesthetic. If your client wants a customized showering area, ProSource will be able to provide inspiration and insight into the project. 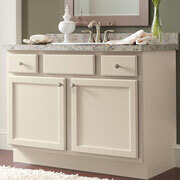 A vanity is the best way to optimize for space in your client’s bathroom. So, suggesting a vanity could be a good idea. Luckily for you, our showrooms showcase dozens of vanities. Visit your local Fort Myers showroom today. After a long day, a bath can be the ultimate cure. If your client is looking for a deluxe bathroom, a bathtub could be a beneficial addition. 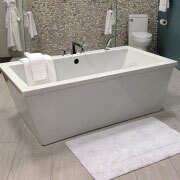 Afterall, a tub can amplify a bathrooms look and give it an appearance of luxury. 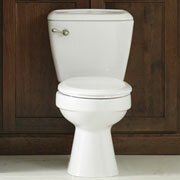 As one of the most used items in a home, your client will need a toilet in their bathroom. Our showroom has an array of toilets to look through. Bring your client to a showroom today! We are proud to serve Fort Myers, Sanibel, and Captiva Island, Florida, and the surrounding area. The ProSource of Fort Myers showroom is conveniently located in Fort Myers, Florida and serves all of the neighboring cities including Alva, Boca Grande, Bokeelia, Bonita Springs, Cape Coral, Captiva, Chokoloskee, Copeland, El Jobean, Estero, Everglades City, Felda, Fort Myers, Fort Myers Beach, Immokalee, Labelle, Lehigh Acres, Marco Island, Moore Haven, Murdock, Naples, North Fort Myers, Palmdale, Pineland, Port Charlotte, Punta Gorda, Saint James City and Sanibel.